Throughout his career, Eugene Puryear has taken a stance against police brutality, mass incarceration, bigotry, homelessness, and poverty. Puryear will discuss the topic of “Resistance in the Trump Era: Movement Strategies and Tactics for Liberation” at 4:15 on Feb. 20 in the Watson Forum. He is an organizer, writer and radio show host who encourages those who are passionate about issues within our society to find their voice. “Eugene is a young, experienced and incredibly insightful leader in the United States,” said Professor of Education Studies, Derek Ford, who coordinated Puryear’s talk. His insight will better educate DePauw students on significant issues regarding the Movement for Black Lives, and hopes to further inspire students who are already passionate about the movement to make a greater impact nationwide. “I think this talk will bring important issues that many are aware of, closer to home,” said sophomore Tabitha Adams, a senator in DePauw student government. Eugene’s talk is meant to be inspiring for all students who attend. “Students should expect [from the talk] hope, validation, possibility and the idea that we can actually make the world a better place, one that we actually deserve,” Ford said. 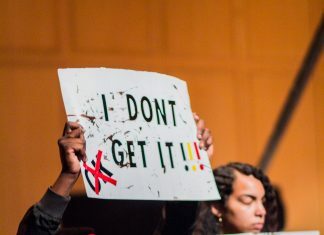 First-year, Alexa Jenkins said that students attending Puryear’s talk will gain a better understanding of what the Movement for Black Lives is. “It is very easy to stay within the DePauw bubble… having speakers like that come in reestablishes reality for DePauw students,” Jenkins said. By attending this talk, students will learn about, “the history of non-violence and what it really means in different contexts attaining to social justice,” Ford said. Other issues that the Movement for Black Lives has taken a stance on will also be discussed during the talk. Students will be encouraged to ask questions and have a conversation with Puryear while learning about important issues from a different perspective. “Hearing this talk will prompt others to partake in campus protests and to take advantage of opportunities that the school is offering,” Adams said. Puryear’s talk will be an opportunity for students to connect with other students, learn about important issues and be exposed to different views on these important societal issues. After the formal talk, students will also have the opportunity to ask Puryear questions. In addition, students who are interested in meeting Eugene Puryear outside of his talk can contact Professor Derek Ford.